Many of us started new work routines at the beginning of the year. I know I definitely have been trying to make my work outs more challenging than last year. And my muscles are definitely feeling it. It always feels great to get a good work out in, but sometimes, your muscles need a little rest and relaxation. That's why I was so excited to try the R&R by Empower Fitness. My muscles always get really sore after a difficult work out, so I always like to incorporate something more relaxing on my in-between days, like yoga and stretching. Lately I have been using the R&R and I absolutely love it! Enjoy the benefits of a massage therapist at home or on the go with this compact and convenient massage roller. Restore your mind and body by relieving muscle stiffness, taming tension and improving flexibility. This stress relief system includes an inside compartment for storage that holds your stretching strap to alleviate tight muscles and stress ball to squeeze away the tension of the day. Our self-massage & stretching program will rejuvenate you. The illustrated guide takes you through a series of movements where you use the pressure of your body to roll out pain, improve circulation and stretch muscles. Reach areas of your body you cannot get on your own. R&R has all your tension-tackling tools in one convenient package! 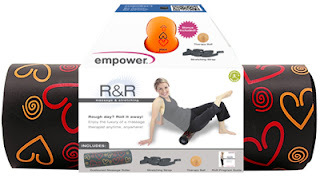 The R&R contains a specially designed roller with durable PVC core and cushioned foam cover, palm sized foam massage ball, stretching strap with foot loop and a workout guide that has 13 exercises that you can try using your R&R tools. It is the ultimate relaxation kit! I love using the roller to massage the knots out of my muscles. It works really well on the stiffness in my neck. I have noticed a big difference since I began using it! I also enjoy using the stretching strap and the massage ball. All of these tools uses together make up a really relaxing and rejuvenating workout! I would highly recommend the R&R from Empower Fitness to anyone! It works great to relieve muscle stiffness and improve flexibility. 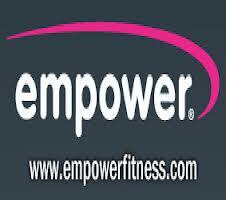 Be sure and check out all of the other great items Empower Fitness has to offer as well while you are there! A Visit From The Fairy Hobmother!